← When Life Hands You Lemons Make Grilled Cheese! 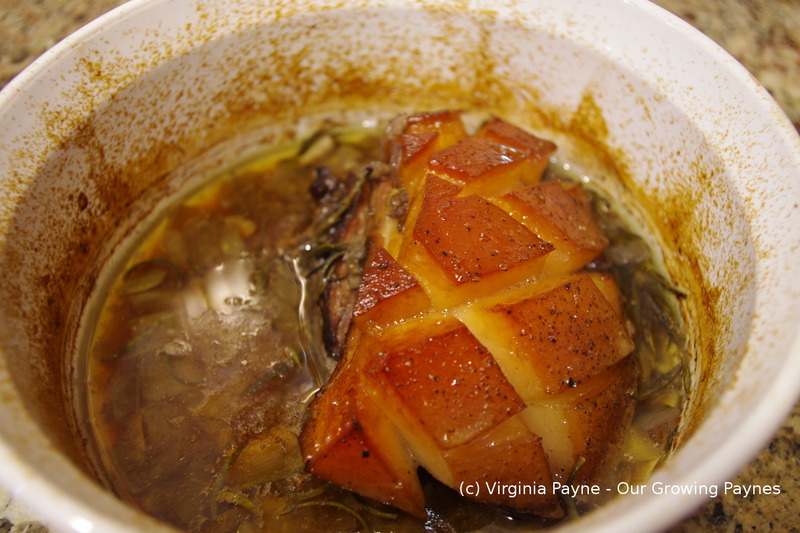 Such A Treat – Pork Belly! A few months ago I was able to try pork belly for the first time. I had heard how wonderful it was so I kept an eye out for it. One of the restaurants downtown had it as a special so I couldn’t pass up the chance. I was hooked. Buttery, tender, and oh so good. But then I couldn’t find it in any store so I could try it at home. That is until recently. Our local co-op was selling big pieces of it so I snapped one up. I figured I would cook a small piece for dinner and save the rest for my attempt at homemade bacon. That is still on the list for something after tax season. 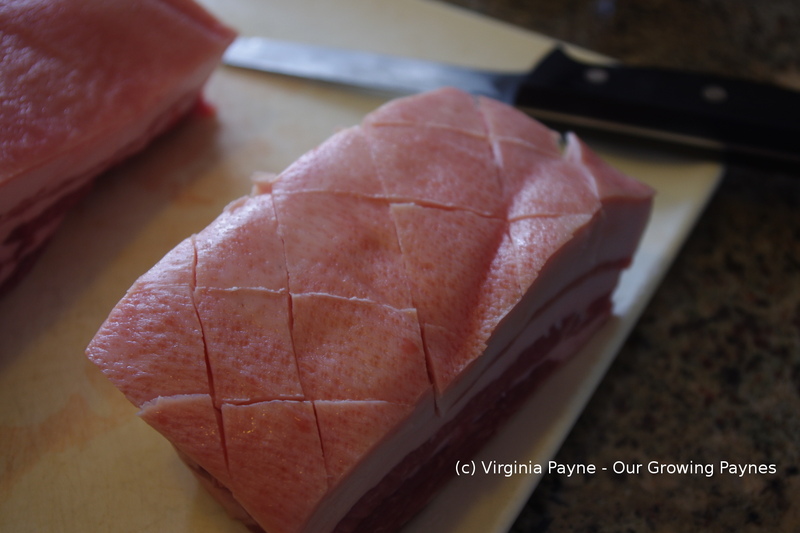 Cut off the piece that you want to roast and score a diamond shape into the fat. Don’t go so deep that you hit the meat. This will help render the fat down into the pork. Rub some sea salt and pepper into the skin with some olive oil. Place into a baking dish. 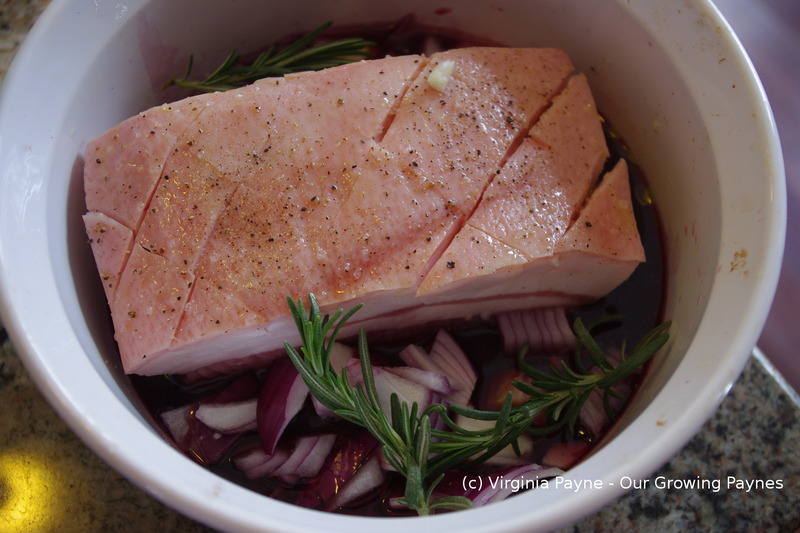 Next I added some rosemary, a few cloves of garlic, half a red onion, and red wine. Bake covered for a couple of hours until nearly done. Remove the cover to brown the top. If you want more of a crispy crackle then uncover sooner. This would be too much fat for me so I wasn’t overly worried about how crispy it was. 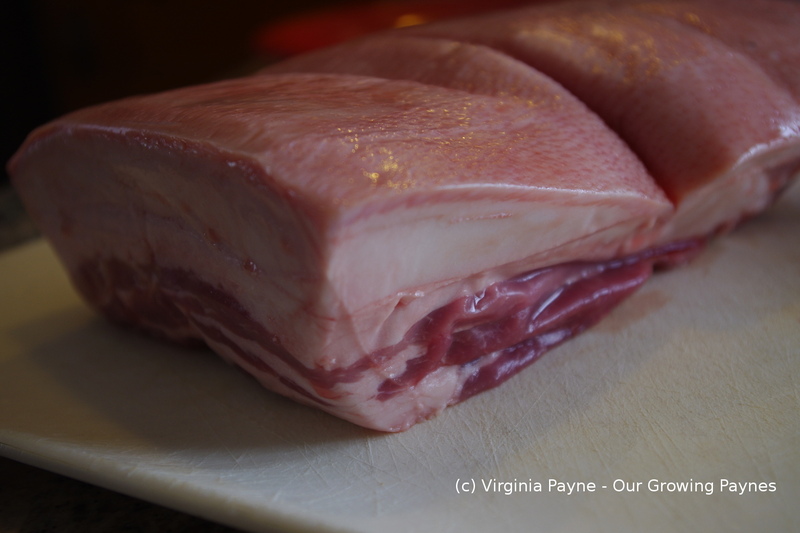 Some will remove that fat and roast the fat to make it really crispy as a treat. Set aside the pork to rest. 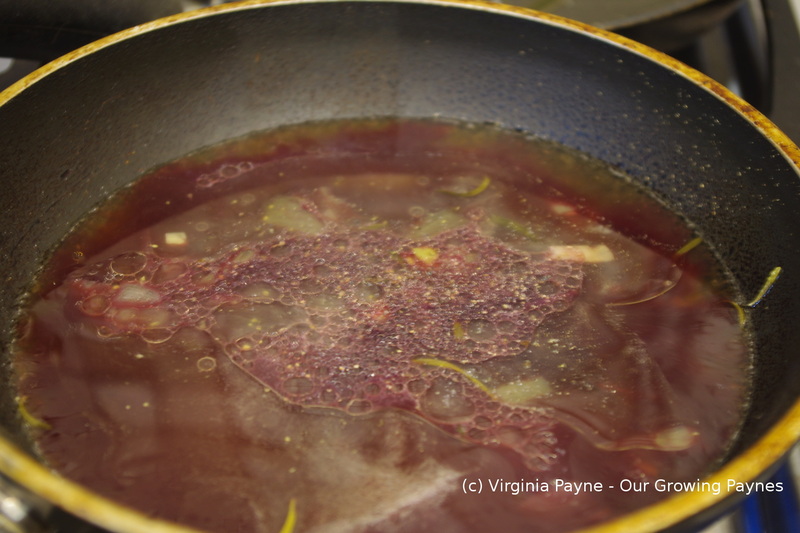 In a skillet pour about half the juices in and add some more red wine and about a 1/2 cup of veg broth. Simmer to reduce down. Once it’s reduced by half remove from the heat. It is ready to serve. 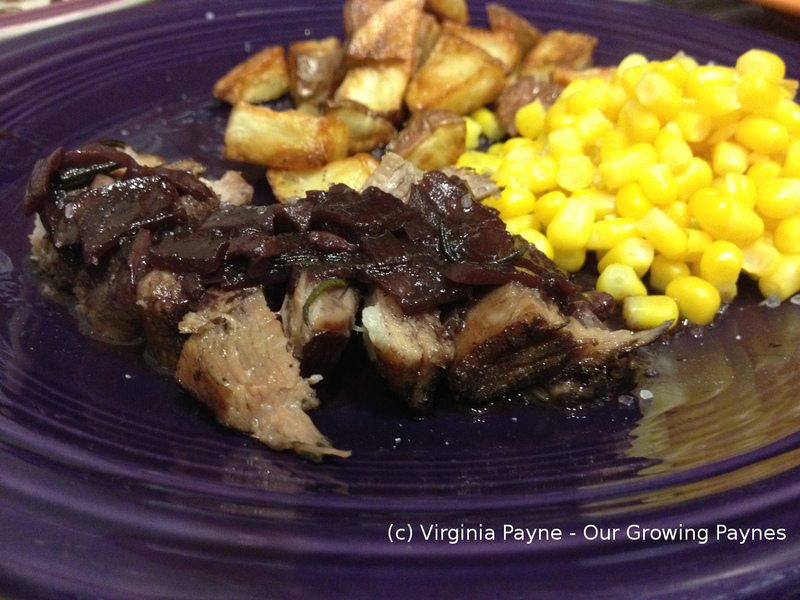 I added roast potatoes and some corn for my dish and my husband had some Brussels sprouts. I really loved it. I’m looking forward to trying my hand at the bacon. But I will make something along the lines of this again. This entry was posted in Pork Recipes and tagged cloves of garlic, cooking, dinner, food, garlic, Onions, pork, pork belly, rosemary. Bookmark the permalink. The crispy part is called crackling and is yummy. Used to be our favorite treat with the Sunday pork roast. Easy to scape off the excess fat underneath. Your pictures are great. This looks fabulous! I love pork belly! I am not a meat-maker; I put my husband in charge of that. But I had tobacco-smoked pork belly at a restaurant once, and it was divine. That’s interesting. I would have thought it would be bitter though. Once as a kid I bit a cigar and oh that was awful! So now I’m curious. I really wasn’t sure what to expect either, but it was perfect! I’ll have to try it if I see it.